The blooming of cherry blossoms signifies the advent of spring to the Japanese. Okinawa, Japan's southernmost prefecture, is the first place in the country to celebrate spring, and the island’s cherry trees are adorned with rich pink blossoms every year starting in early January. Locals follow with interest the progression of the cherry blossoms, such as ichibuzaki and sanbuzaki (10 or 30 percent of blossoms on the tree, respectively), announced daily in various media, for the optimal time to see the cherry blossoms in full bloom. One of the earliest cherry blossom displays in Okinawa can be enjoyed at Motobu’s Mount Yae Cherry Blossom Festival, which features about 7,000 cherry trees lining a three-kilometer-long road winding up the mountain, giving Mount Yae a delicate color from base to peak. 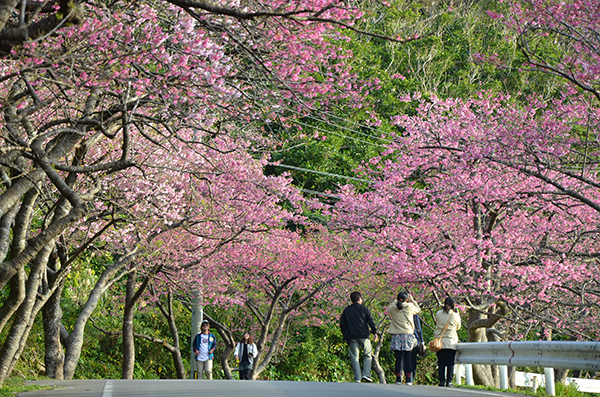 The Nago Cherry Blossom Festival is famous for its two-kilometer walk lined with over 20,000 cherry trees. Along with the Nakijin Gusuku Cherry Blossom Festival these are considered to be Okinawa's three biggest and most popular cherry blossom festivals, attracting a large number of visitors from all over the country. The Nakijin festival is held at a UNESCO World Heritage site, the Nakijin Castle Ruins, and it's famous for the fantastic sight of cherry blossom and the castle ruins lit up at night. Having a picnic or a taking leisurely stroll while admiring the spectacular view is the ultimate way to experience the Japanese spring. 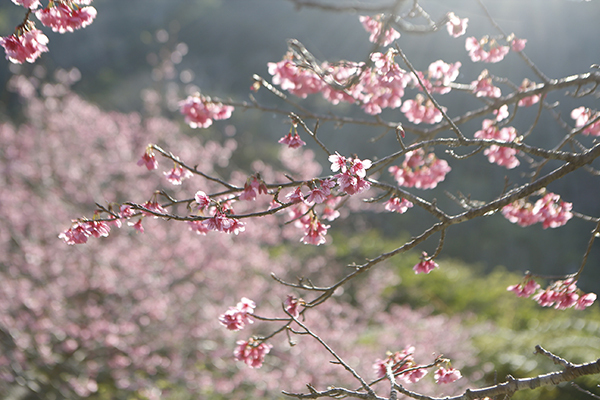 Here we would like to introduce some tips for enjoying cherry blossoms around Okinawa. Unlike in mainland Japan, where the Somei Yoshino (Prunus yedoensis), is the most commonly planted ornamental cherry species, the typical cherry tree in Okinawa is Kanhizakura (Cerasus cerasoides). Kanhizakura is characterized by its downward facing flowers in a vibrant bright pink color, which evokes the feeling of a tropical paradise. In addition, Kanhizakura is remarkably tolerant of wind and rain, and once in bloom some flowers last from two weeks up to one month. Approximately 7,000 cherry trees lining a three-kilometer mountain road give Mount Yae (453m) a delicate color from base to peak and the pleasant scent of flowers. Located on the mountainside, Sakura-no-Mori Park features playground equipment and a stunning view of Ie Island. The castle is situated 100 meters above sea level on a hill overlooking northern Okinawa as well as Ihei and Izena islands to the northwest. The high stone walls surrounding the ruins are lit up at night, and the path leading to the castle from the gate is lined with candles, adding a touch of romance to this historic site. Traditional Okinawan entertainment is performed on the specially erected stage during the festival. Yaese Park is wrapped in a fantastic atmosphere with about 170 lanterns lighting up the cherry trees that line both sides of its long flight of stairs. Perched on a hill, the park overlooks a spectacular night view of the southern part of Okinawa. This is a perfect opportunity to immerse yourself in an Okinawan festival.